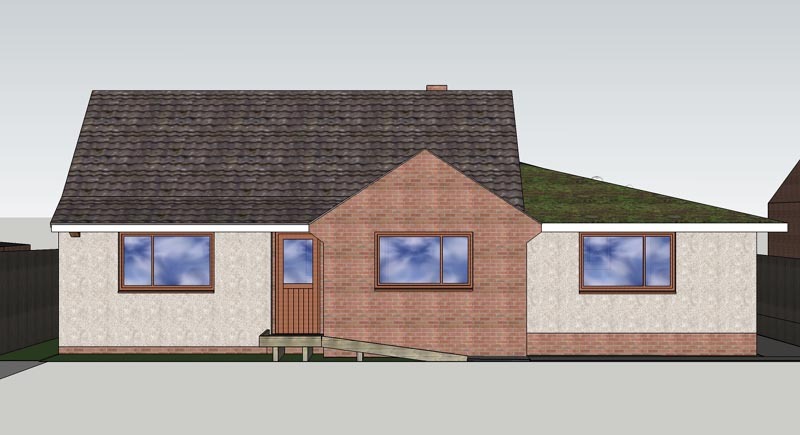 I'm feeling very fuzzy headed but pleased, having just finished extensive 'artists impression' of the bungalow design and its position in the street, mostly to show neighbours when we go to talk to them about our plans this week, but it might help planning application too (to illustrate the proper plans). This is a north elevation image capture (without the front garden and street) from the 3D model. After a gentle nudge in the right direction from Kuba (designer) we've decided to go with plain lime render for the exterior of the strawbale sections, and are hoping the planners go for it. We think it looks a darn site better than any 'brick-coloured' pinkish paint. The render we're likely to use is a lime render made up using crushed recycled glass instead of sand, which we like the look of. Much less energy is needed to collect and crush glass bottles than to extract new sand for use in the render.